Texture of chicken with a subtle shellfish flavour. Available in packs of 2, 8 or 25. 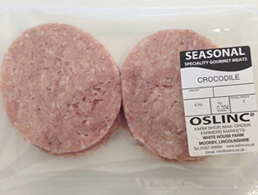 Crocodile Burgers packed and sealed in a tray. Made fresh and suitable for home freezing.